It is most likely, that in your high school classes, your final finishing grades are identified as alphabetical letters (A-, B+, etc.) or as percent (92, 85, etc. out of 100). A GPA, first translates those letters or percent into numbers, and then averages these numbers collectively. GPA is practiced across the US, Canada and Australia. However, the grading scale is not the same for every country. In the US and Canada, the GPA band is 0.0 to 4.0 points, with 4 being the highest mark/score, although few schools in Australia use a GPA band from 0.0 to 7.0, with 7 being the highest mark/score. Higher schools in the U.S. use different methods of computing point average because sometimes these systems are a little different from each other. Both 4.0 Scale and 4.0+ Scale are used. 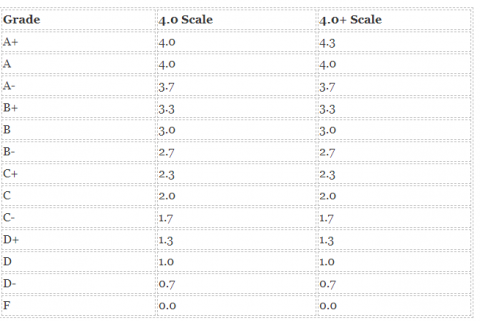 Confirm which scale is implemented in college you enter. Now let’s study how GPA is calculated by exercising different methods. As you can comprehend from the above table, determining grade point average using 4.0+ Scale system will be different if a student has excellent accomplishments. Some colleges use more specific grading systems when they assess students on a 0-100 scale instead of using letters. In this event, a student who’s got 90 points on average would have point average of 3.5. However, another student having 92 points would get the value of 3.7. This gives a chance to evaluate caliber of students in a just a few easy steps. The first and foremost thing to do in order to evaluate a grade point average is to convert each of the final class grades you’ve achieved until now in high school into the right decimal. Add all the converted decimal grades and you get your total sum. Calculate the total number of classes you’ve attained. There are two leading types of GPAs: weighted and unweighted. When schools use unweighted GPAs, they use a scale that goes from 0.0 to 4.0 and doesn’t take the complex level of classes into consideration. However, several schools use a weighted GPA model, which takes class complexity into account by using a scale that goes from 0.0 to 5.0. This gives higher numerical values to grades achieved in Honors/AP/IB classes. For example, Jack gets an A in standard-level US History while Susan gets an A in AP US History. With unweighted GPAs, both A’s are considered equivalent—i.e. each becomes a 4.0. On the other hand, with a weighted GPA, Jack’s A would convert to a 4.0, while Susan’s A would translate to a 5.0 to show that her class took a lot more additional determination and effort to top. The key dissimilarity in calculations of weighted and unweighted values is that each grade in the calculation of weighted point average is tight to class levels. Hence, by adding 0.5 to scale for Honor classes of medium level and 1.0 for AP classes of high level, you can convert point average to regular subjects. Mind that the difference between weighted and unweighted values can be significant.